This weekend’s “Nor’wester” snowstorm promises to bring more snow to our region. But slick roads aren’t the only thing we need to be concerned about. Snow can wreak havoc when it melts, too. Remove large accumulations of snow from areas where it could melt and enter your home. 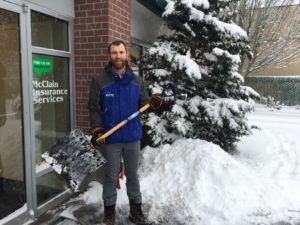 Shovel snow away from the perimeter of your home. Snow accumulation near your foundation, windows, and doors can leak into your home once it starts to melt. This can cause damage to your foundation and personal property, both indoors and out. Remember to clear decks, patios, and driveways that slope toward your home, too. Clean snow and debris from ground drains and gutters. Make sure drains near your home and gutters are unblocked. Ice and compact snow can create dams that keep water from draining. Don’t forget to clear your street storm drain of snow and debris, too. Consider where snow will go when it melts. The combination of melting snow plus rain can create extreme runoff conditions. When shoveling snow on your property, think about which direction it will drain when it melts. You may want to dig channels to divert water to the nearest storm drain. Do not get on a ladder and do not attempt to climb onto your roof to remove snow. Getting on ladders or your roof any time of year is a risky proposition, even more so when snow is involved. In extreme circumstances, if ice dams need to be removed from your gutters, call a licensed and insured professional specializing in this service. If you see the snow melting and dropping off the edge of your roof, that’s a good sign. It indicates ice dams are probably not developing. Know what’s covered by your insurance policy. Not all household water damage is treated alike – freezing pipes may be assessed differently than seeping snow. Read your insurance policy carefully and call your local, independent insurance agent to determine what’s covered. We’re here to help! If you do incur damage inside your home because of melting snow, it’s important to take quick action. At the first sign of dampness inside your home, call immediately for professional help before long-term damage sets in. As a Certified Insurance Counselor and licensed insurance agent, I get to know people and their families and coach them through their changing insurance needs. Outside the office, my life revolves around my family. We love crabbing in Puget Sound, running, skiing, and hiking, and we believe this is the year the Seattle Mariners will finally win the World Series. Go M's! Previous Post: Does Homeowners Insurance Cover Frozen Pipes?